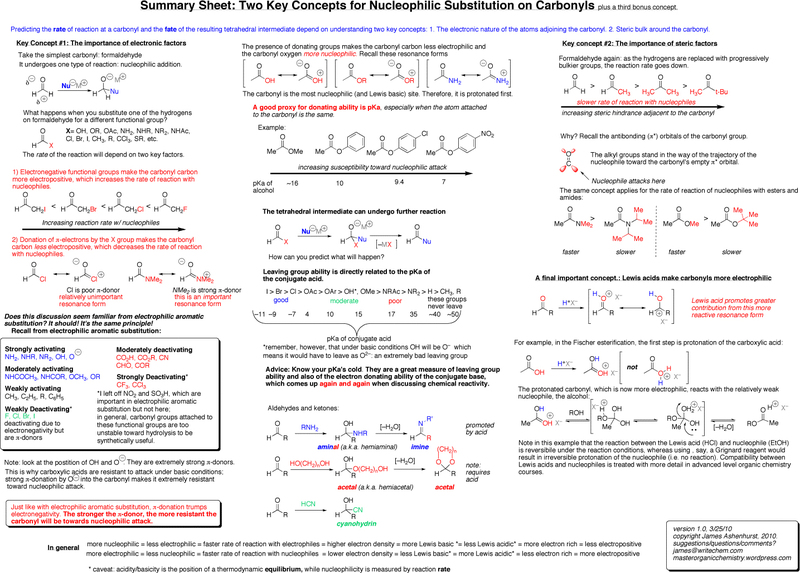 I put together this summary sheet for the reaction of nucleophiles with carbonyls (click for larger image, see link to downloadable PDF below). 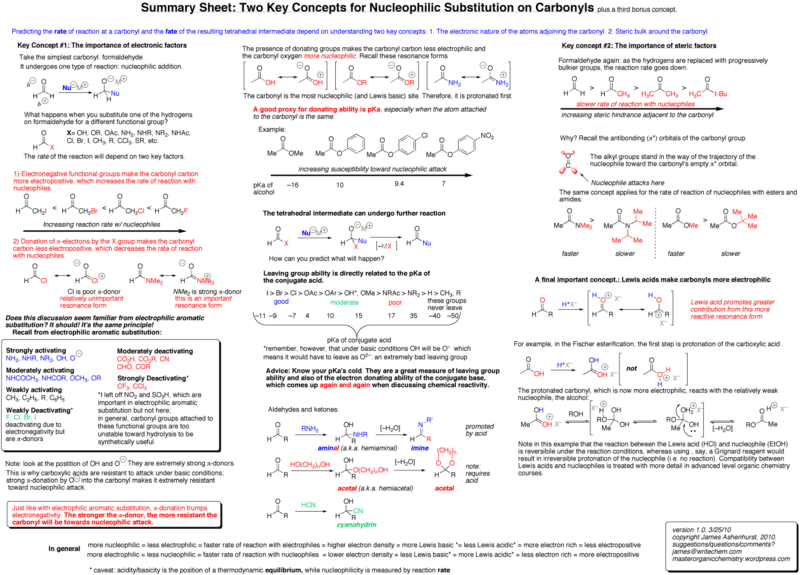 It summarizes the two key concepts that are important to understand for these reactions: the effect of electronic and steric factors on nucleophilic addition. I enjoyed doing this and I’d like to put together more of these types of sheets in the future. If you have suggestions for future topics, leave a comment. Deactivating due to electronegativity but are pi-donors. Activating due to electronegativity but are pi-donors? I see your point. The “deactivating due to electronegativity but are pi donors” statement refers to how halogen substituents affect electrophilic aromatic substitution, where halogens “deactivate” the ring. In the case of carbonyls, the electronegative substituents should activate the carbonyl toward nucleophilic attack, but pi donation in this case would be “deactivating”. Thanks for pointing this out. Right. I got confused with the deactivating and activating because I thought this was in respect to the carbonyl group. 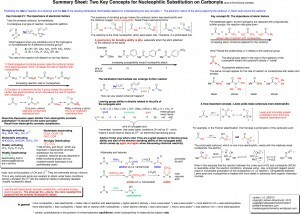 Have you considered making a summary sheet for Substitution and Elimination Chemistry or Electrophilic Aromatic Substitution? You’re disgusting…memorizing organic chemistry? Why do you even take it if you’re going to not understand the material and keep anything for yourself after the class is over? how could you possibly be this rude about something that everyone must do in ochem. You think I fully understand what is being taught? No, of course not–I’m not the professor. Sometimes you need to memorize stuff to understand it asshat. Hate to tell you this, but whoever’s telling you that you can go through ochem without memorizing anything is lying to you, particularly when it comes to various reactions.